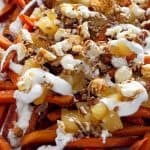 My sweet potato poutine is just as comforting as the original version but involves sweet potato fries, marshmallow, apples, pecans, and caramel corn! Have you ever had poutine? Who can resist fries with gravy and cheese curds, am I right? But have you had a sweet version? Poutine is a Canadian dish made of french fries, topped with cheese curds, and covered with brown gravy. A delicious, decadent, salty, comfort food that will fill up your heart AND your soul. I mean, who can resist crispy golden french fries? Much less gooey cheese curds? Topping it with gravy is really the proverbial cherry on the sundae. 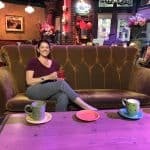 I love the concept of comfort food, topped with more comfort food, and covered in comfort food! If these sounds addicting to you, have you ever had a sweet version? A dessert poutine if you will? When I started to think up a sweet version I tried to match up a sweet food with its savory counterpart. Just take me to the Sweet Potato Poutine Recipe Already! 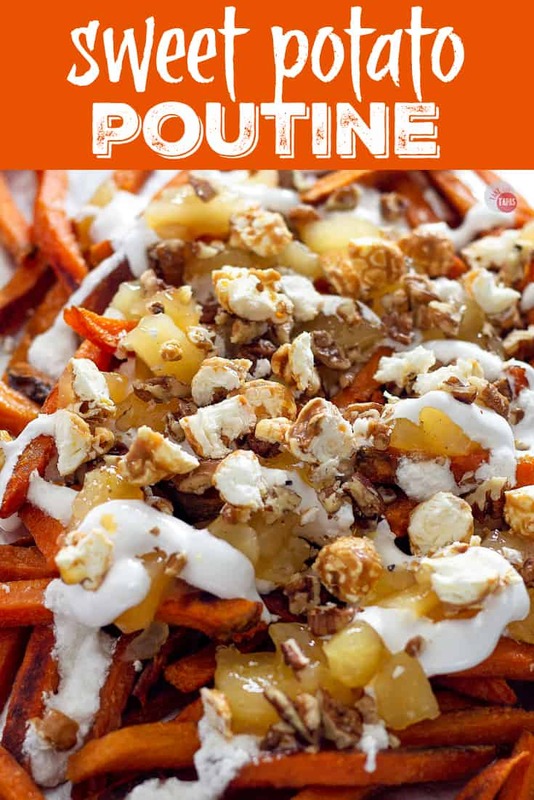 If you’d rather skip my (very helpful, I think) tips and tricks, essential cooking info, and similar recipe ideas – and get straight to this delicious easy Sweet Potato Poutine recipe – simply scroll to the bottom of the page where you can find the printable recipe card. Normally we would start with straight-cut, french fries, lightly salted. I start this sweet potato poutine with sweet potatoes on a baking sheet, Lighted salted with sea salt. Don’t underestimate the power of a little salt, even in a dessert recipe. 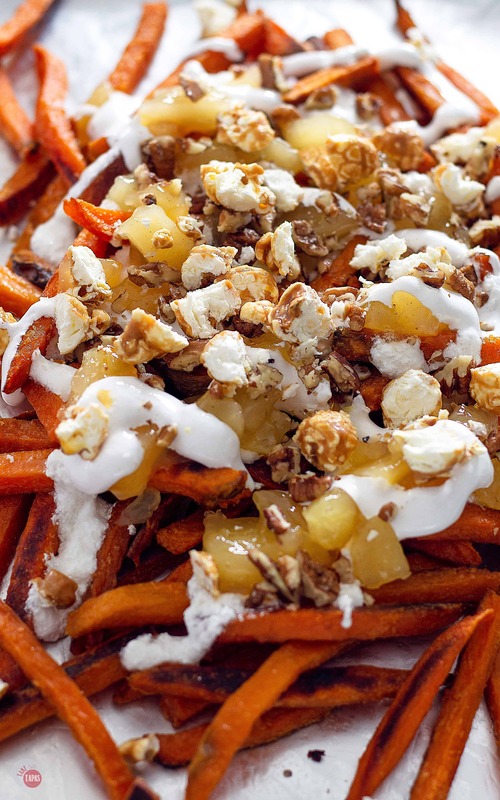 You can also make the Sweet Potato Poutine with the waffle version of sweet potato fries too. More surface to hold the toppings. Bake them in the oven until golden and crispy. You need them to be crispy and hot to receive the rest of the poutine ingredients! Once you have the base set you can start building the Sweet Potato Poutine! To replace the poutine cheese curds in the original recipe, I wanted something sweet but had a similar texture. Baked apples come to mind. But not just baked apples, but the soft and juicy apple chunks found in apple pie filling! you can make your own, or just buy the canned version. Nothing wrong with taking a shortcut in the kitchen. Once you have the fries and the cheese curds switched over to the sweet side its time to talk about the gravy. Traditionally a savory brown gravy, I decided to go with marshmallow fluff. I did the same thing with my pretzel dessert nachos and it works like a charm! 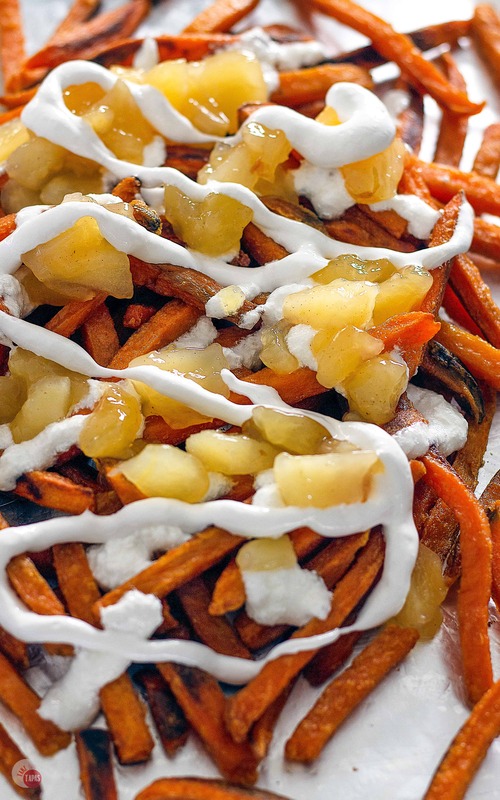 Warm and melty marshmallow fluff drizzled over the hot and crispy sweet potato fries and cinnamon baked apples. Q: How do you pronounce Poutine? A: Poo – Teen is the way to say it! Q: What’s the difference between Poutine and Disco Fries? A: Poutine is from Canada and Disco fries are from New Jersey and they usually have melted cheese sauce or mozzarella cheese and covered in chicken gravy. Q: Can these be made ahead of time? A: I wouldn’t recommend it as the fries will be cold and everything will get soggy. It also doesn’t store or reheat well. You should eat them all when you make them. Q: Can you use regular marshmallows if you don’t’ have fluff? A: You can but I would use the mini marshmallows. To look like “gravy” you want it too seem to spread on the fries. Technically the sweet potato poutine is complete but I really have a hard time stopping myself when it comes to piling on extras. Like crispy and crunchy texture add-ons. 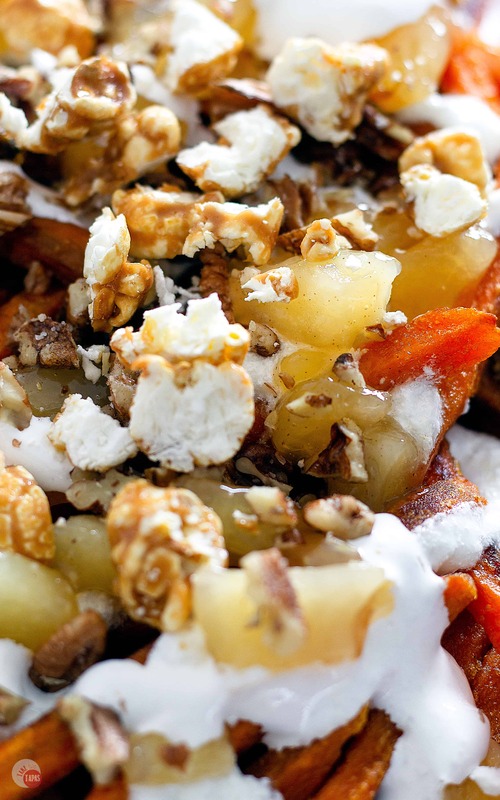 Top the Sweet Potato Poutine with buttery toasted pecans and/or caramel popcorn. I couldn’t help myself and I used both. A sprinkle of cayenne pepper also added a little spice to all this amazing sweetness! Other great POUTINE recipes to try! If you love this SWEET POTATO POUTINE Recipe as much as I do, please write a five-star review in the comment section below (or on Pinterest with the “tried it” button – you can now add pictures into reviews, too! ), and be sure to help me share on facebook! My sweet version of poutine is just as comforting but involves sweet potato fries, marshmallow fluff, apple pie filling, pecans, and caramel corn! 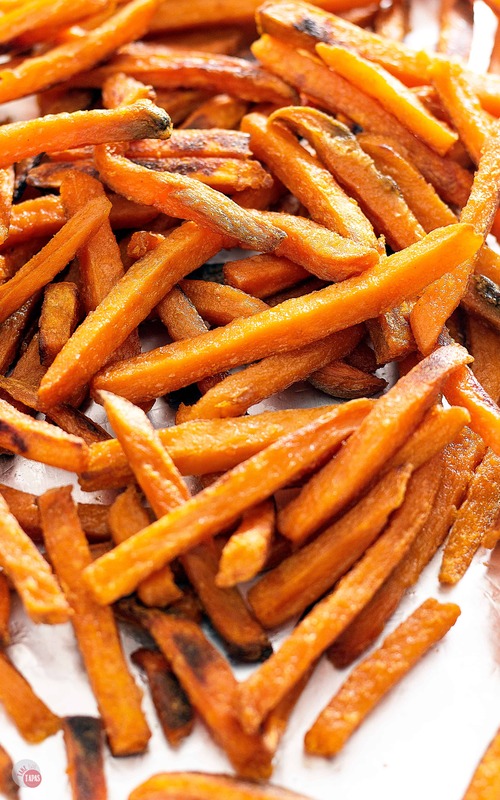 Bake the sweet potato fries according to the package instructions. When they come out of the oven, squeeze the marshmallow fluff over the fries. Spoon the apple pie filling over the sweet potato fries and marshmallow. You can heat it up or leave it room temperature if you prefer. Top with toasted pecans and caramel popcorn. Enjoy hot with lots of napkins! This is the ultimate poutine recipe! I’ve only had the savory gravy version, so I’m super excited about this sweet potato poutine. I’ll try the waffle style to make sure I get lots of the goodies on top! This looks and sounds DELICIOUS!! Can’t wait to make it for my family.